PEORIA, Ariz. — It always comes back to the knee. It’s not as if Kyle Lewis needs a reminder of what has happened to him and what he’s trying to overcome. If he were ever to somehow momentarily forget, he need only to look down at his right knee where the scars from two surgeries — one major and one minor — remain. Unfortunately, so much of his brief professional baseball career has been defined by injury and the interruptions that followed. And while he’s always focused forward on his future, anything he’s done always comes with a recollection of the injuries that cost him time and development. It’s something he realized in the grind of rehab. And yet, the knee issues that have plagued Lewis, dating back to a gruesome injury July 19, 2015, when his knee exploded on a slide/collision at home plate in Everett, shouldn’t be permanently forgotten. They provide context to the situation. 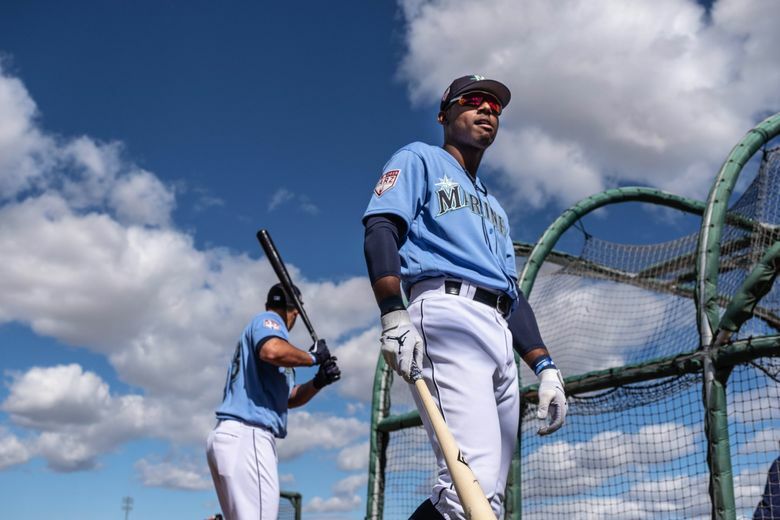 Monday, when Lewis jogged to right field of Peoria Stadium before the top of the first inning, it marked the first spring training game he’d ever played for the Mariners. How is that possible for a guy drafted in the first round of the 2016 draft? Well, he’s been never been healthy enough to participate fully in spring training. In 2017, he was recovering from the devastating initial injury, which required complete reconstruction of a torn anterior cruciate ligament and medial and lateral meniscus. After an abbreviated season in which he dealt with tendinitis and other issues, Lewis underwent another surgery to clean up scar tissue in the knee and remove a bone spur. It left him rehabbing and recovering during spring training 2018. Lewis didn’t have time to be nervous or dwell on being out on the field for his spring debut. The first batter of the game, Nick Senzel, hit a line drive to Lewis that he fielded with relative ease. “I got that pretty hard hit ball at me to get my feet wet,” he said. In his first at-bat, Lewis got jammed on a fastball that ran up and in on his hands, but he was able to fight it off to bloop a single into right field. The second at-bat provided a feel-good moment for the Mariners and the fans who have followed Lewis’ speed-bump filled path. Facing Reds reliever Michael Lorenzen, Lewis smashed a 2-2 fastball over the fence in left-center. Spring training stats and results might be meaningless, but Lewis’ homer felt different. And then the baseball side came out of Servais. Once considered the top prospect in the Mariners organization, Lewis now is ranked seventh by Baseball America. The combination of injuries and other prospects acquired were responsible for his slide from the top. But the Mariners believe he’s a major part of their “step back” plan and a possible starting corner outfielder by 2021. Although Lewis hasn’t been on the field as much as he’d hoped, that hasn’t stopped him from growing as a player. He’s trying to embrace the Mariners’ philosophy of taking “control of the zone” while also taking advantage of the new technology and improvements added to the player-development system. Lewis will return to Class AA Arkansas for the start of the 2019 season. But the circumstances are different. For the first time since being drafted, he should enter a season on time and healthy. There have been no complications with the right knee. Lewis split the season between High-A Modesto and Arkansas. He didn’t start his season until May 12, playing in 49 games for the Nuts. He posted a .260/.303/.429 slash line (batting average, on-base percentage and slugging percentage) with 18 doubles, five homers and 32 RBI. He was promoted to Arkansas on July 21 and played in 37 games, slashing .220/.309/.371 with eight doubles, four homers and 20 RBI. The knee is no longer an issue or an excuse.